Case Study: New Ideas For Old Machines | KLH Industries Inc. In a flurry of new machines on the shop floor, one wire EDM machine has proven that age has its advantages. This advantage, ironically enough, is usually its disadvantage. Most wire EDM machines today are made to be submersible (for faster cutting) with only one collapsible side of the tank, the front. Manufactured nearly a decade ago, KLH's lone DWC300HA is not a submersible wire EDM (thus no tank), but has three open sides. 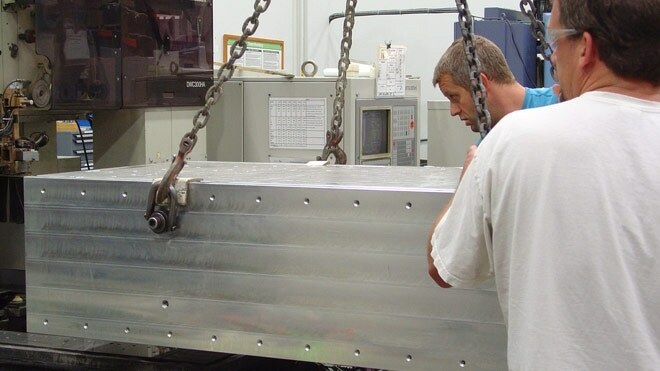 This creates a spacious living environment when the tenant is an aluminum block measuring 70" x 29" x 16" tall, and hangs over the edge of the machine. Whoever said aluminum was a light, soft metal never tried to make a 16" precision cut down the weight-equivalent of 105,000 empty soda cans. For this project, KLH thought outside of the submersible box. Accomplishing this task was not about sacrifice or splitting the difference, but splitting the block as the customer desired. Age, or more fittingly, experience is still a valuable input for precision machining services. Proof that you can teach an old dog new tricks, but not without new ideas.